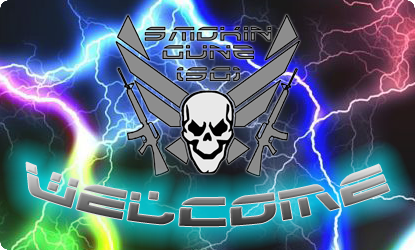 Welcome to the brand new website for the XBOX360 Gaming Clan, Smokin Gunz! It’s been a hard 4 months with all the coding and testing, but that's all over now! This new site has loads of features that you the members have been party to their creation. A forum thread was setup a few months back and in it were suggestions and ideas from the members, expressing what they wanted in the site and how it should function. I took all the ideas, and incorporated them in some way, shape and form into the new site you see here - so if you’re browsing around and you see a cool feature that maybe you suggested, be happy in the knowledge that you contributed to this online community in way not many others have! Some of the features are of course, members only, and as such are not visible until you have logged in. The new login system works only with Clan Members and grants them access to things like Clan Match Listings and results, enhanced features for all sections of the site and various others things, all of which you will need to find out by looking around and exploring the site! I would like to thank everyone who helped me out over the last few months, it’s really come together and I think you will all be pleased with the way this site now operates. Special thanks to my BETA testers, B1X and SYNISTAR, who without them this would have taken a lot longer to come to fruition, and my Creative Assistant, SubNova, for his work on the [SG] Mission Logs - Thanks a million guys! Enjoy your new website guys! P.S. Sorry about the April Fool, we couldn't resist! !